* Clean community laundry room, near unit. * Three (3) heated pools with incredible mountain views surrounded by tall palms. One of these is a saltwater pool * Central AC and heating * Ceiling fans in great room* Fully furnished and decorated by professional * Kitchen fully equipped, plus basics like coffee, sugar, etc. * Cable TV and DVD (in great room and bedroom) * Washer & Dryer on premises/ Iron & board * Weber BBQ * Internet Access wireless. Arriving from a chilly British Spring , it was wonderful to feel real warmth on our backs, the apartment at Mountain Cove was very well appointed and equipped being very comfortable . Location was very quiet and we always felt very safe, scores of good restaurants abound some only a short walk away. 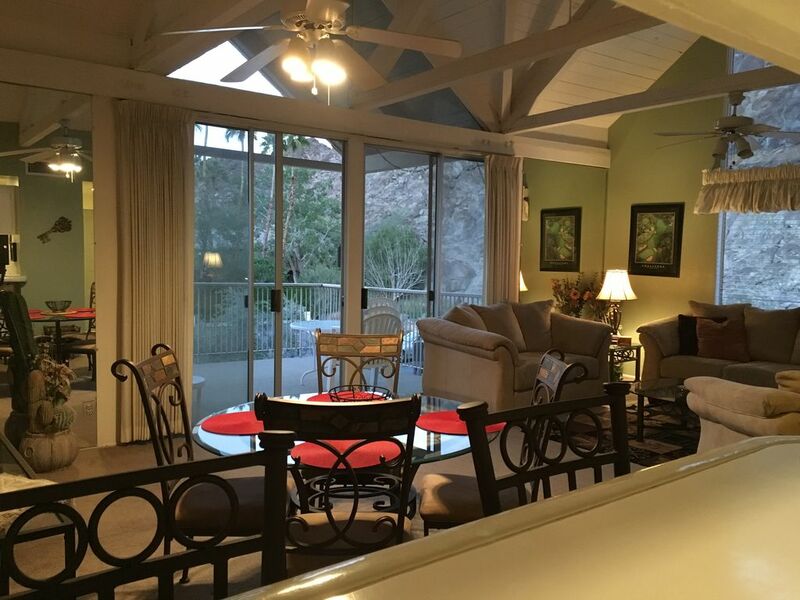 A superb base to explore the Coachella Valley and surrounding areas, complex has three pools all well equipped with sun loungers, all in all a great stay. Very nice location in a well maintained complex. Property has a well designed layout. Our first stay in Indian Wells was a great experience. The property is located in an area close to many stores, dining establishments, and bars. It provides easy access to the main highway for traveling out of town. Our favorite times were early mornings on the deck with a coffee and evenings with a glass of wine watching the sun disappear. Unit is well stocked and very comfortable. We loved everything about the place. Open the windows and you see a beautiful Arizona mountain. When we arrived a roadrunner was scurrying down the sidewalk. The grounds were very nicely landscaped. The condo was comfortable and well stocked. It is located close to grocery stores and restaurants, and only 6 miles on back roads to the polo grounds. * Walking distance to shopping, fine dining, grocery store, etc.